Hello from Singapore! Well, in around 3-4 hours time I'll be on stage performing at the always epic Comedy Masala show. It always feels good to take a moment to just take in the fact that I'm once again blessed to be doing stand up comedy, especially now that it's out of Hong Kong! 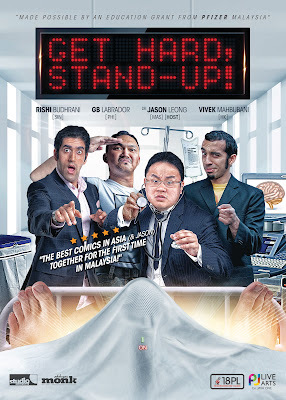 Rishi Budhrani: I met him in Singapore when I first started comedy masala and we've had many gigs together including Karma Komedians in Singapore! Update: So here I am 5 days later in Hong Kong already. It's always weird when I start a blog entry and then find myself almost a week later, picking up from where I left off. So the Comedy Masala show was fun! It's always a great crowd there! I got to hang out with some people after the show and it was nice just talking and then headed back to the absolutely awesome Wangz Hotel room! After being put up in small, tiny hotels the last few times, it was overly-refreshing to get a wonderful room! Before I continue, if you haven't heard the song by Daft Punk called Get Lucky, stop everything and check it out. I first heard it on the Colbert Report when they were supposed to appear on the show but had to cancel at the last minute. Then I went on Groove Shark and heard the rest of the album. I have to say, ever since watching Metallica live in Singapore, I've found a new love for live experiences especially with music. I suppose I have to be totally into that band to truly enjoy it. I mean, I remember going to watch Slash when he came to HK, but since I wasn't very much into his stuff, I couldn't fully enjoy it. On the other hand, I will never forget the epic Lamb of God show I got to enjoy many years ago. I know every single song of theirs and man, it felt like every song was the song I wanted to hear! Ahaha, hopefully one day that'll happen for comedy :P I mean, Jerry Seinfeld did it in his I'm telling you for the last time where I'm sure most of the audience went to go hear specific bits. It's quite odd, this comedy thing, I've actually done gigs where people booked me and told me which bits they wanted me to do, I've also had gigs where people told me "I want all new material, if I've heard it at your show, it better not be at my party". Woah!? Speaking of the cloud, now that I have 300M Fiber-to-the-home broadband service, I can finally take advantage of the cloud like I've always wanted!! So yeah....umm..happy uploading both ideas, files and what not. Enjoy your next 10 days!